Kroll’s mastery at creating fluid yet structured form, juxtaposing and manipulating colour of intense impact and brilliance and his huge skill at layering paint with force, finesse and subtlety, puts his work in a class of its own. His dizzying inspiration and output is phenomenal. The physical and mental impact of the work, hanging in boardroom, boudoir and baronial hall worldwide, can take you ‘over the edge’, out of this world and into a universe of pure plastic art in form and content, line and colour. It is a sophisticated combination of the rational, the natural and the metaphysical with a continual internal balancing of these universally conflicting and harmonising elements; the core of its irrepressible strength and enduring popularity. 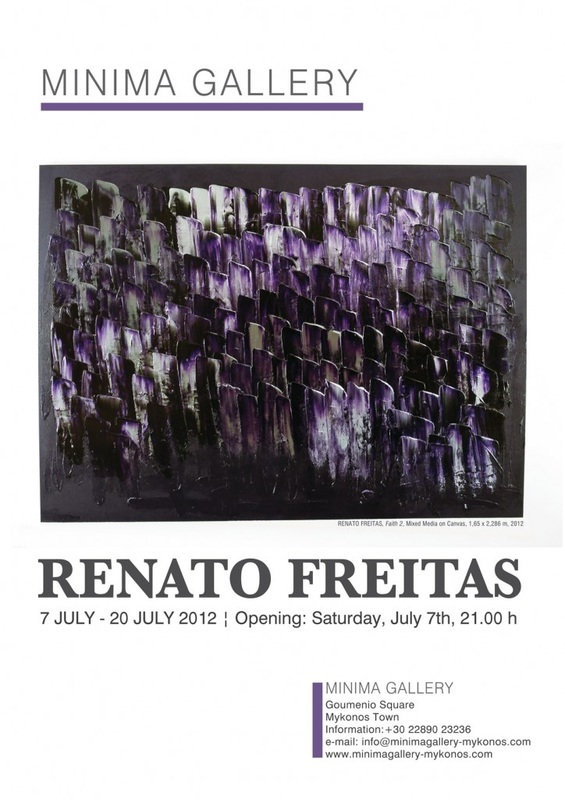 Renato Freitas works have been presented in solo and group exhibitions in galleries throughout the United States, France, UK, Greece, Kuwait and Brazil. He studied filmmaking at New York Film Academy. Renato was born in Brazil in 1974 and now lives in Miami. no beginning and no end representing today’s fast lifestyle. issues with humour and fun. force with subversively critical, moral and philosophical messages. Established since 1997 in Mykonos Greece,Minima Gallery showcases a range of contemporary artworks by both upcoming Greek and foreign artists.